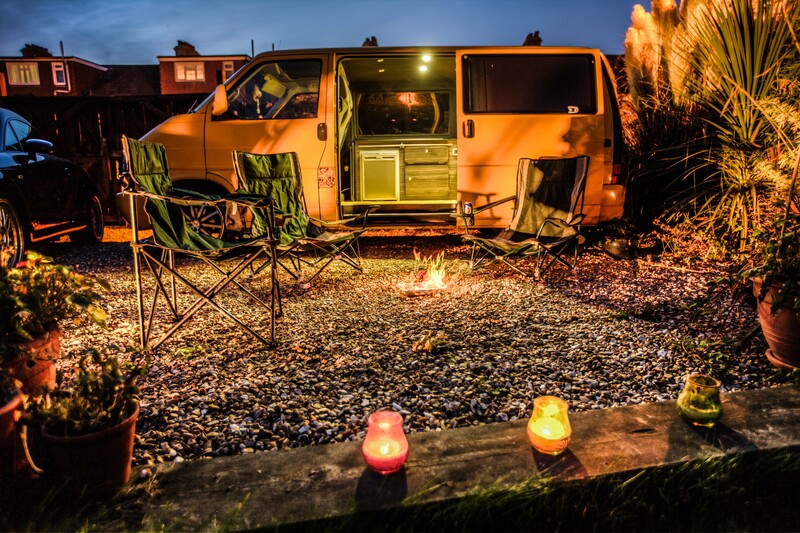 It seems that when you buy a campervan, the first place you sleep in it would be either your drive if you have one or on the street outside your house, just in case it’s not quite what you thought and a warm cosy bed isn’t too far away. In keeping with this tradition, we parked the van on our drive, lit a bbq, invited Laurens mum round and had a few drinks and something to eat. Summer was drawing to a close at this point so the nights weren’t particularly warm, the first mistake we made was leaving the van door open until we were ready to retire. The van was not warm inside, cool would be the most accurate description. We were also unaware of the existence of thermal blinds which in winter, keep the cold out and the heat in, summer the reverse, they cover every window in the van. They also block pretty much all light, I’ve always slept in complete darkness and over the years I have conditioned Lauren to sleep this way too, our van was not dark, it glowed orange from the street lamp and the flashing blue LED I installed for the alarm further added to the prevention of darkness. The other thing we hadn’t counted on was the cat, she knew we were inside, she was outside and wanted to be inside with us, when she wasn’t outside meowing at the top of her little voice she was on the roof walking about creating noise and generally being a nuisance. I found the bed pretty comfortable but Lauren was less impressed, the bed was too hard, the cat was annoying and the cold was, well, cold. At 06.00 enough was enough and we retreated to the house just in time for the birds to start singing and the sun to rise, joy. I wouldn’t say the first night in the van was a success on the comfort and good night sleep front but it did give us ideas on how to improve on the experience. We now own a full set of thermal blinds which make all the difference on the temperature and darkness front, we are currently looking for a suitable mattress topper and the cat is left at home, that was always going to happen.